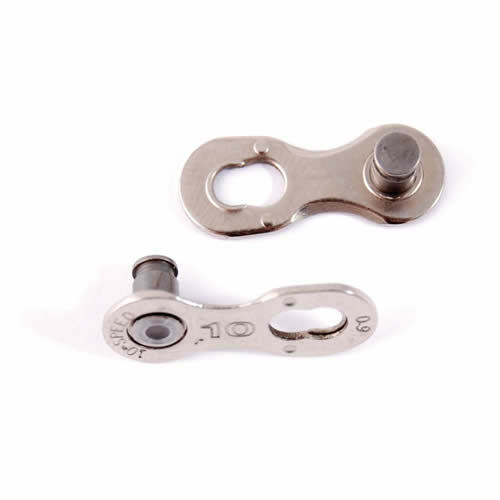 Quick and easy joiner link for YBN 10 speed chains. Makes life nice and easy!! Has worked as well as the KMC quick link. I've opened/closed them many times without premature failure. It has lasted as long as the chain. Much easier to work with than split pins, and it appears SRAM quick links. Very useful trail aid and easy to join. Allows easy chain removal for cleaning. Vital component to carry (with a chain tool). Not used yet following change to 10 speed but previous experience with 9 speed suggests well worth having. Cheap 10 speed quick links for easy on the road repair. Not used them yet but they fit nicely in the off-cut of chain that I have. Brillant, works perfectly with shimano 10 speed chains. Easy to use. So much better than using the rivet on the chain. Used these links for years, I replace with every new chain never had an issue. Much easier than trying to use the Shimano pin. Excellent value.....does what it is supposed to do and reusable too. Worked fine with a Shimano chain. So much easier than using a pin on a shimano chain. Hassle free. Still the easiest and cheapest way to join a chain - never leave home without one. Great simple piece of kit at sensible price, quick and easy to fit and disconnect as long as you have a chain tool to set chain length. Also worth carrying one as a spare in tool kit incase of chain failure. I have a Shimano XT 10 speed chain and have started to always carry with me at least one of these quick links. They make the difference between potentially having to walk for many miles to find a fix, or continuing with your ride as if nothing had happened! I would definitely recommend these as you never know when your chain might snap and leave you stranded in the middle of nowhere. I bought two of these a couple of months ago just as emergency spares (see my previous review) & gave them five stars for quality & price. Since then I have had to use them both on my mates bikes whilst stuck in the middle of nowhere; both shimano & sram setups. These are a brilliant bit of kit for the price & that is why I've just bought two more. Five stars again. Essential bit of kit. Haven't used it but small and portable and could be vital should my chain break far from home. Works great with shimano chains, used one kept another as a spare, easy to fit in seconds. SRAM had a real winner with Powerlinks, no need for a black pin, easy chain removal and re-fitting. Then along comes 10 speed and Powerlocks, with single use stupidity, thus negating any advantage they had over shimano. These links remedy that. Excellent product, really good value for money. I would highly recommend these for any emergency spare kit. These little guys make chains a breeze to work with. Always use these links now. A doddle to open, (important if you need to do it on a ride because some are a pain without the correct tool) and they join and rejoin easily. Top product. Works as the sram and kmc ones, only for less dough... Why pay more if these get the job done?? Easy to install, snaps closed without fuss. Saved me on a journey where I had no chain tool. Keep a spare one sealed (to prevent rust) in my saddle bag. Parfait! Great product. Works well and is robust. Better than SRAM which locks so you cannot undo on the trail. I have used these for the last 2 years and never had a breakage. Seems to do the job fine - my chain didn't come with quicklinks, and SRAM ones aren't reusable so this seemed like a good bet. Only a couple of rides in, but so far so good. Decent price too. Works with shimano and sram chains, very good. Great little product, better than SRAM 10 speed Powerlocks because not being quick release they defeat the object. All in all very handy! Just the job, makes splitting chain for cleaning easy. Looks to be top quality. I kept one in the saddle bag, along with a chain splitter. Quick links, never leave without them. Fixing your chain has never been so simple, as the name states, "QUICK". This is the best price on the net. The easiest way to join a broken chain. Bought too keep as spares in case out on the trail as9 and 10 speed are different sizes. These are great, cheap and seem to be strong. Only use a new one when I replace the chain. Whats to say, works with Shimano 10spd and makes chain removal & cleaning that much easier! Very good no problems fitting the link. Not problem with transmision when fitted. It locks, it releases, essential item when on long rides as a spare in the pack. Essential item for your tool kit. Great item to cleam your chain after each ride. Great little peice of kit that makes life nice and easy. Such a small item but when needed it is the difference between a long walk home or a good day cycling. Everyone should carry a couple of theses. Not used YBN before but they look and feel well made. Great little device that allows you to remove/put back chain very quickly! The only removable quick link I have seen for 10sp chains. More of a fiddle to remove though than the old 9sp Sachs/ SRAM system. I run Shimano XTR chains on my MTB and have used other common known brand name connector links. The YBN brand has matched the performance of the others and is good value for money. Would I buy this again, simple - Yes. As always, next day arrival of items, great price and no nonsense. Merlin always sort you out!